EM Lock with LED is capable of holding doors weighing up to 600lbs it also comes with indication device to monitor the status of the premises, whether it is opened or closed.This lock help in restricting the person access. These electronic locks can be used with remote controls, access controllers, attendance machine with access control. These locks have very fine finishing. If you have any query or want to place an order please contact us now at 9315441078 WhatsApp 9315441053, 9818390836 or email us at info@ampletrails.com. 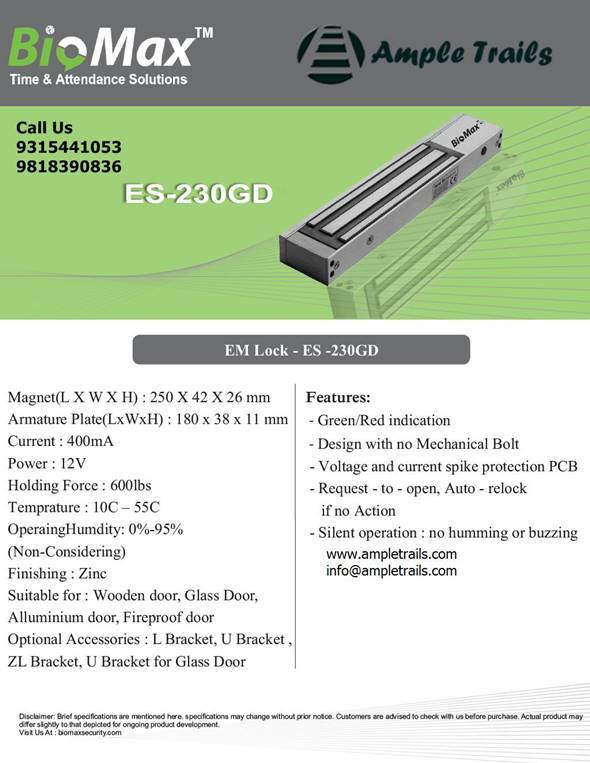 EM lock can be used in offices, shops, factories, server rooms, toilets for limiting the access. EM lock is used by jewellers to restrict the entry in his cash room. A shopkeeper is having 2 rooms in his shop one is for the general public where he showcase his products the other room is used by the owner of the shop for doing administrative work like accounting, cash handling and other related activities. EM lock is installed at the gate of the room and is controlled by the remote control. Access is granted to the authorized persons only. Access control system plays a very significant role in the safety of an organization.